Crisp, pleated fabrics in a range of colours and styles, including elegant patterns, and rich, appealing textured weaves. Heat reflective Topar® coatings are available for enhanced sun protection making Plissé an ideal solution for conservatories. 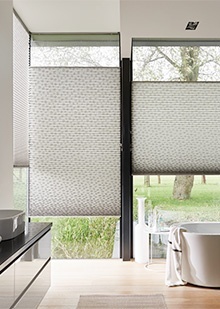 Versatile and highly decorative, Plissé Shades are a perfect for any window size or shape. 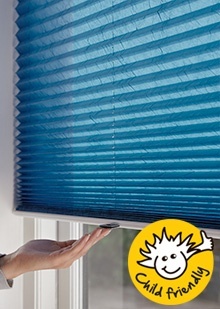 Our Plissé Shades feature Child Safe systems including LiteRise®, motorised systems, chain tensioner and cord cleat. Sloping roof windows Crisp and narrow pleated Plissé Shades are designed to cover nearly any window shape, particularly suited to cover sloped windows and conservatories. 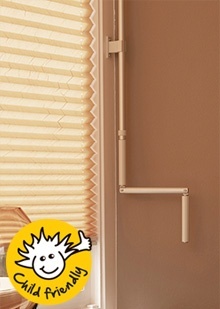 Easiest and safest way to operate Simply push up to raise and pull down to lower. Your shades stay right where you put them. Free hanging Plissé Shades are available in four fabric opacities, for precise light control and privacy. They offer a perfectly stable pleat pattern. Choose from a wide variety of sheer to room darkening fabrics in an extensive range of colours. 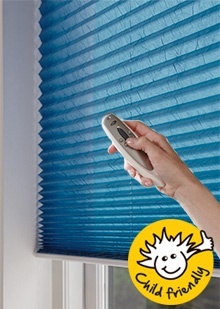 Top-Down / Bottom-Up The ultimate in versatility, Top-Down/Bottom-Up Plissé Shades from Luxaflex® offer you the ability to operate shades from the top down, the bottom up, or in combination of the two. Quite literally the best of both worlds—natural light and privacy all in one. 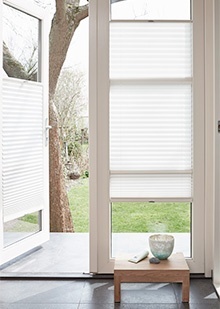 Tilt & turn windows / doors Our side-guided option fixes your Plissé Shade onto the window frame, holding it in place and eliminating any light leakage along the outside edges. Tensioned systems are designed to fit neatly into the frame of your windows, doors and skylights and eliminate the need for free hanging cord loops. Day & Night A two in one setup which allows you to combine two contrasting Plissé fabrics or even a Plissé with a Duette® Shades fabric. Two different transparencies in one window with endless possibilities when it comes to your own, personal approach to colour co-ordination and eliminating light and ensure privacy. 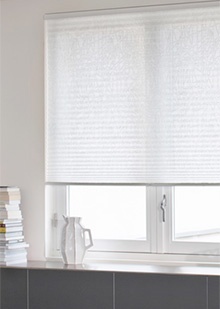 Plissé Shades from Luxaflex® feature crisp, pleated fabrics in an extensive selection of colours and styles, including beautiful weaves, elegant patterns and rich, appealing textures. Heat reflective Topar® coatings are available for enhanced sun protection making Plissé an ideal solution for conservatories and other window applications where intense, direct sunlight is a factor. Versatile, highly decorative, and always crisp in appearance, Plissé Shades are a perfect solution every window size and shape. 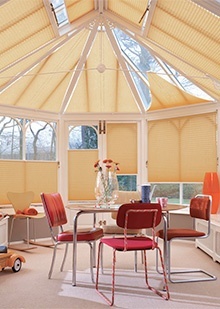 Luxaflex® Plissé pleated blinds offer a practical, modern style which suits any type of window. With 20mm pleats they can be fitted within standard glazing bars to give a neat, flush finish to any style window. Available in a wide range of colours and fabrics types. Advanced fabric technology does not come at the experience of style. 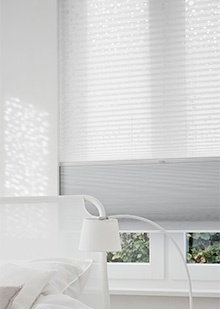 Luxaflex® Plissé blinds are available with 3 new fabric treatments offering solar reflection, dirt and moisture repellence and antibacterial properties.